As I don't want to repeat what has already been written better by others, so please refer to the following reviews for a detailed history of the Fairy Firefly here and here. Coming in a small, crude and badly printed end opening box, there are 4 sprues of soft white plastic parts. One, with the two lower wing halves, is not in the photograph. There is one clear sprue with three canopy parts. This is one of the Russian model manufacturers better efforts, with only a small amount of flash. The parts are well defined with a small mould seam visible on the smaller parts. There are a number of ejector pin marks, most will be hidden inside the fuselage, but ones on the wheel doors will be visible and should be dealt with. There was no obvious sink marks except in the belly of the crew figures, and no short shot parts. The panel detail is very fine raised lines, which will disappear with the slightest touch of sandpaper, or under a generous coat of paint. The two cockpits each have a floor and seat in one piece, the pilot has the luxury of a control stick. There is no side wall detail or instrument panel provided. Two figures are included, which apart from the sink mark look fairly good, and detailed enough to be wearing recognisable life jackets. The wheel wells are an open void allowing a nice view through the pilots canopy. The wheels are doughnut like but the hub detail looks very like photographs of the real thing. The four cannon are moulded onto the upper wing halves. Eight unguided rockets and their racks are provided. The wing is engineered rather oddly, the lower surfaces look like they could be assembled folded, but not the top surfaces. Unlike the somewhat older Airfix kit, which could easily be built with folded wings. The clear parts are thick and full of flash, distortions, ripples, bubbles and bumps. A spider web of stretched sprue radiated from the hub, showing the part was de-moulded before cooling. A dip in floor polish improved them, but they are still not usable. 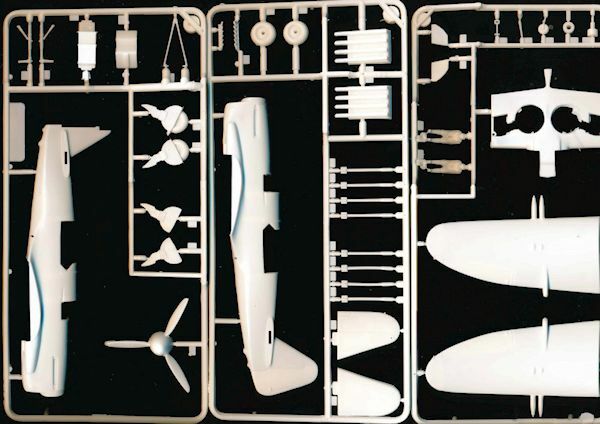 A replacement set is available from Falcon, the Fleet Air Arm set No. 19. Despite what is shown on the box art, the kit cannot be built with the flaps lowered and the pilot's canopy open, without some surgery. 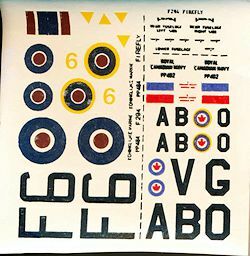 Decals are for Royal Navy and Royal Canadian Navy aircraft. Badly printed with poor registration and blurry ill-defined images they are best consigned to the bin. There are aftermarket decals available from Aero Master amongst others. Originally released by Frog as F257 in 1972, the kit is typical late Frog in design, the shape seems to be spot on, but there is not much detail. I didn't check the scale, or count the rivets, but Frog generally got it right. The mould had not been trashed when this kit was moulded. Beware though, I bought another of these kits in a bag, over 20 years ago. Most of the parts were already removed (torn off) the sprues, very heavy flash, short shot parts, sink marks and parts broken or missing. All in bright green plastic. The clear parts and decals however, are much better than the other boxing and quite usable. I really wanted an early Firefly but still haven't built it. At about 1/5 the price of the Pavla/Octopus kit, the ex-Frog kit may seem at first glance good value, and would be an easier build. But factor in the cost of a decent decal sheet, a replacement canopy set and the desperate need for detailing and there is not much difference. The Airfix Firefly, a Mark 5, is available from time to time. A much older kit, first released in 1967, it is festooned with rivets, but can make a nice model. The USSR moulded ex-Frog kits are often available at swap meets, bagged or in rough boxes, have a look under the table. Your local hobby shop may even have some stashed away in a back room, they don't have much “shelf presence”. Have a good look before you buy, as the quality varies from usable to horrible. Don't pay more than a few dollars, they are not “rare collectors items”, there are plenty around as they don't get built much any more. If the ex-Frog kit is of a German or Italian aircraft, you may get it in a big Revell box at several times the price, but you will get good decals. It the aircraft is Japanese, chances are Hasegawa have re-boxed it, they may have even moulded it originally. Recommended, as long as you don't mind the extra detailing and replacing the canopy and decals. David Mondey, British Aircraft of World War II, Hamlyn, London, 1982. Plenty of stuff on the internet – go google.